Sun Seeker has carved out a universe all their own in Nashville, TN. Biddeford, their first EP and second release on Third Man Records, is near combustion level with beautiful atmospherics, willful lyricism and a supernatural ear for atypical pop hooks which should ring immediately familiar to fans of their debut 7’’ “Georgia Dust”. Six charming vignettes explore friendship, romance, and the daydreams populating the space between them. EP highlight and single, “Won’t Keep Me Up At Night”, gives us the best of singer and principal songwriter Alex Benick – his ability to breathe life and a depth of scenery into a song, especially with the clever rhythms of drummer Ben Parks and guitarist Asher Horton’s near-perfect pop instinct. Sun Seeker has climbed into broad daylight, into blessed dynamics, and every song blossoms as a result of it. Barry says: Sun-soaked guitars and hazy basses roll around the mix, topped with beautifully shining vocal melodies and imbued with vague melancholic leanings. 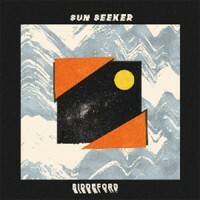 It's a beautiful and endearing outing from Sun Seeker, and one set to endure for a time to come.